With temperatures in Washington topping out at 98 degrees on Monday, CAT Entertainment Services (CES) was put to the test at the MLB All-Star festivities. As the provider of generator power, distribution, and technical services for ESPN, Fox, and MLB Network, CES was tasked with keeping the power on and the crew cool at one of the hottest MLB All-Star weeks in memory. CES supplied three separate redundant power systems providing a combined 540 kVA of UPS-delivered power to the MLB All-Star production compound at Nationals Park. As part of a resiliency plan, CES supplied three separate redundant systems providing a total of 540 kVA of UPS-delivered power to drive the production compound. To ensure redundancy, a completely different system was used to power the Fox Sports trucks in the main compound at the park’s truck docks and to power the MLB compound outside. On Monday, when the heat became too extreme, CES was forced take the environmental systems of the trucks off the house power and put them on a redundant source, a move necessitating fast action. 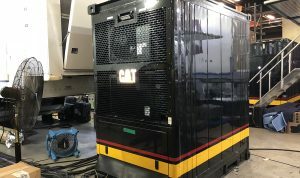 Fortunately, CES had another show ending in Brooklyn and was able to bring in the 20-ft. twin 400-kW generator used there to supplement the show at Nationals Park.